Operational efficiency in the operating room (OR), a key revenue-generating department, requires coordination of multiple personnel and processes. When any one of those processes experiences a delay, the effect across the rest of the surgical services can translate into delayed patient care, lost revenue, and surgeon dissatisfaction—to name a few. One key process to facilitate a smooth schedule throughout the day is the management of first case starts. Delays in first cases impact the operational flow for the remainder of the case load. 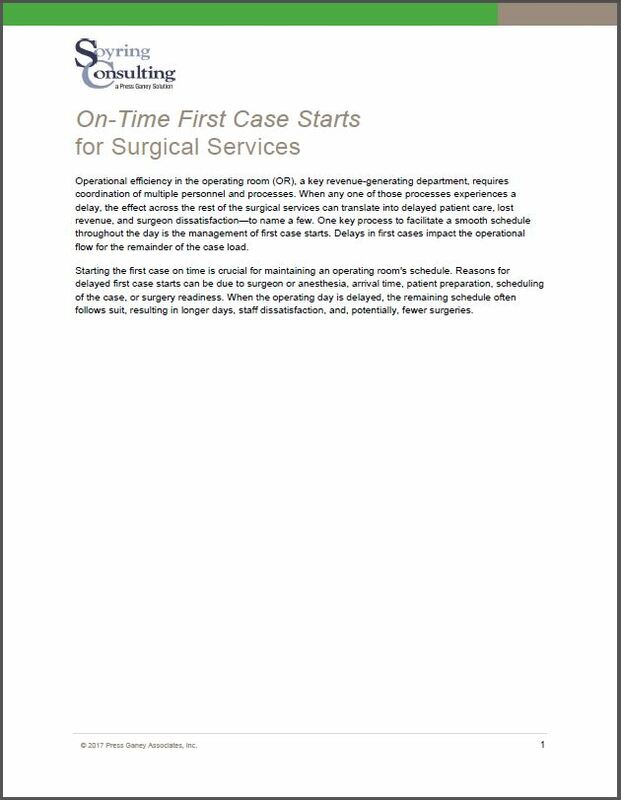 Starting the first case on time is crucial for maintaining an operating room's schedule. Reasons for delayed first case starts can be due to surgeon or anesthesia, arrival time, patient preparation, scheduling of the case, or surgery readiness. When the operating day is delayed, the remaining schedule often follows suit, resulting in longer days, staff dissatisfaction, and, potentially, fewer surgeries. Do you your first cases always start on time?